Labor Security System is a leader in the design and production of safety cabinets SAFETYBOX® for the storage of flammable, chemical and gas products. In the market for over 20 years, the Company has always focused the utmost attention on the clients´ needs. This attention reflects in the invention of cutting-edge, innovative products and features. Labor Security System is UNI EN ISO 9001:2008 certified and the SAFETYBOX® products comply with the requirements of the European Norms, thereby obtaining the TÜV SÜD product certifications attesting their greatest quality. The models for flammable storage have all been tested for fire resistance in ministry licensed research institutes. 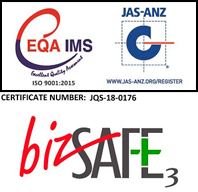 All SAFETYBOX cabinets are CERTIFIED according to EUROPEAN STANDARDS EN 14470-1, EN 14470-2, EN 14727 AND EN 61010-1. Fire tests of all cabinets of the lines for flammable and compressed gas cylinders are carried out at accredited institutions. At Labor Security System, the highest attention to the clients' needs reflects not only in products' maximum quality and continuous innovation, but also in qualified, prompt customer assistance, both pre- and after sale. Labor Security System is a constantly evolving company. We study the needs of the industry in order to offer new solutions and improve existing products, providing information and sales service at the highest level.